When he gets excited, he gets really excited. And for 8-year-old Shaw, tonight he’s excited for the warm up. From the moment he walks in, he can’t wait. The blonde boy, in his gray and black zip up sweatshirt, is eager to to shake his limbs. Scream a countdown. 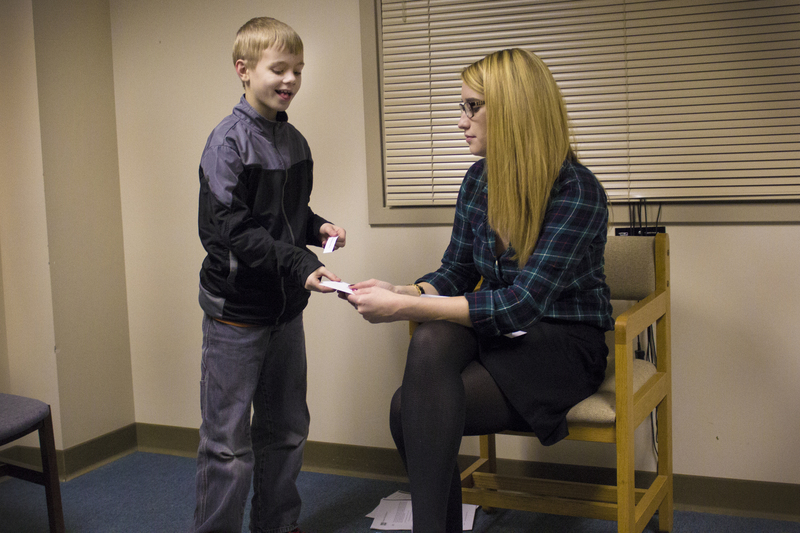 Like the other children gathered beneath the bright fluorescent lights at Indiana State University’s psychology clinic, Shaw’s here for a class specifically designed for 6- to 9-year-olds with high functioning autism. He’s here to practice a skill that, until recently, seemed reserved for comedians and actors. But, instead of entertainment, tonight it’s being used by one of a growing number of groups that use improv to teach social skills to children with autism. For children with autism, socializing can be hard because it involves things like taking turns. “And waiting is very, very, very hard for people with autism and anxiety,” says Janna Graf, Shaw’s mother. She knows. Two of her four children are diagnosed with autism, attention deficit disorder and anxiety. When Shaw was young, it was hard. These days, once a week, Graff takes Shaw to the social skills group in the form of an improv theater class. Rachel Magin, an ISU doctoral student in psychology, designed the class. Her aim is to help these children focus on the different ways people communicate. “Through our facial expressions, through the way our body language shows it or just the tone of our voice,” Magin says. Over the course of the seven-week class, Magin is gathering feedback on how children, like Shaw, interpret these things, the modes of communication that are not words. “Children with autism just are not able to read those cues as well,” Magin says. For children with autism, those cues can be like a foreign language. “And they haven’t necessarily learned that language,” Magin says. But languages can be learned. And improv classes can serve as a language immersion program, of sorts. “OK, here’s what we’re going to do,” says Erin McTiernan, Magin’s co-teacher, as she gathers the class. They proceed with a fairly typical improv game: Shaw and classmates pick sentences out of a bright white envelope and randomly choose a card with an emotion on it. Their task: say that sentence, in that emotion. Sometimes it runs smoothly. 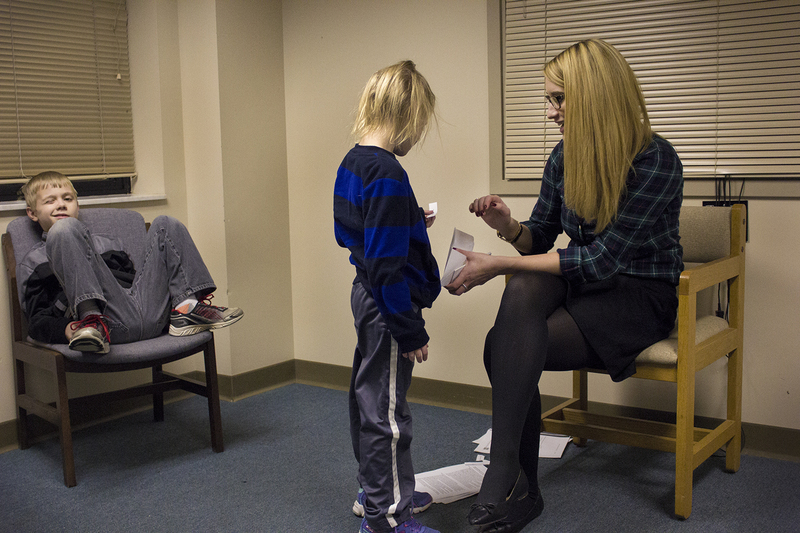 McTiernan helps a 6-year-old student with her combination. “Say ‘it sounds great’ in a happy voice,” McTiernan says. But – like in real life – the way you say the words changes their meaning. So when emotions don’t obviously line up with the words, it can be more of a challenge for these children. “It’s over!,” says Jake, a 9-year-old. Now, the others have to guess the emotion. Magin, the teacher, uses it as a teaching moment. “What would have helped him to show that he was happy?” Magin asks the class. Silas – Shaw’s 6-year-old sister doesn’t have autism, but comes with her brother – she knows. “Yay! It’s over! Yay, it’s over! Yay!” Silas says, jumping in her blue and black striped sweater. “OK, so jumping up and down, having the voice get a little higher and a little louder,” Magin says. The children nod. And they improvise other situations, too. “We’re gonna role play how to deal with anxiety,” McTiernan, the other teacher, says. Perhaps, it’s something we all could use, but for these children it’s especially important. Children with autism can experience anxiety more intensely and more often than other children. In an improvised scene with his sister, Shaw plays someone nervous about going to a new school. “I think it’s going to be scary,” Shaw says. In the scene, his sister has advice. “Take deep breaths and you will not be scared,” Silas says. The idea of the class is pretty straightforward – if children act out different situations, think about their emotions and how they show them — they’ll communicate more clearly in real life. 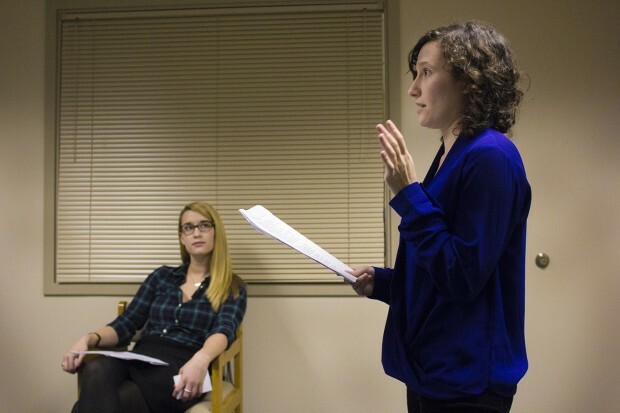 “[Improv] is being recognized as kind of a technology for human connection and communication,” says Jim Ansaldo, a research scholar at Indiana University. Ansaldo also runs Camp Yes And, an improv summer camp for teens with autism and performs improv himself. 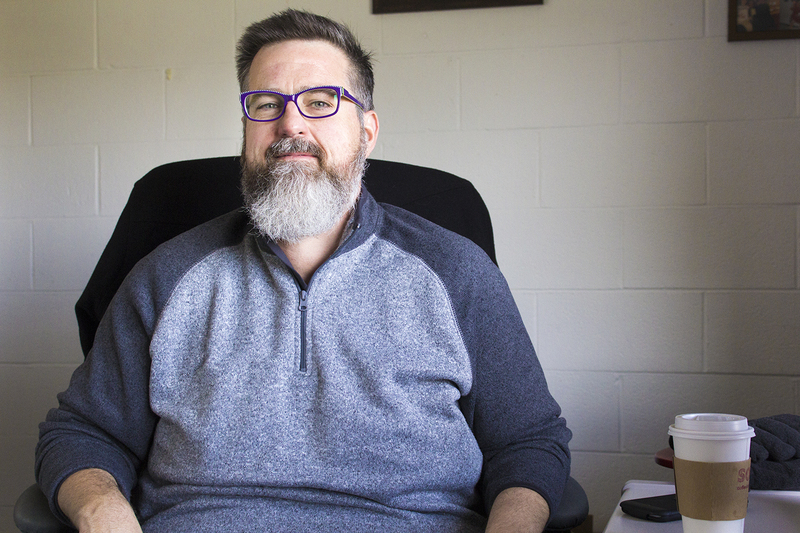 He says improv-specific programs for children with autism are rare – he knows about a half dozen – but their number is growing. “What improv really does is create a safe and fun and authentic environment in which to practice, where mistakes really don’t matter,” Ansaldo says. And Janna Graf, Shaw’s mother, says the change is real. She saw it when the 8-year-old – who, she says, can ramble – introduced himself at a church group. And it’s this kind of feedback that the researchers are using to see how this improv class transfers to real social skills. So far, they’re encouraged by the early results.